HACCP SAFE makes HACCP compliance quick and easy. Use the HACCP SAFE Pro Kit to build your HACCP Plan and food safety system. Protect your business and your customers today with HACCP SAFE Pro. It doesn’t take long to produce a HACCP Plan by following the HACCP SAFE Pro guidelines. Be HACCP ready within days. The program covers all steps and principles of the HACCP food safety system as used by the International Standards Organisation (ISO). 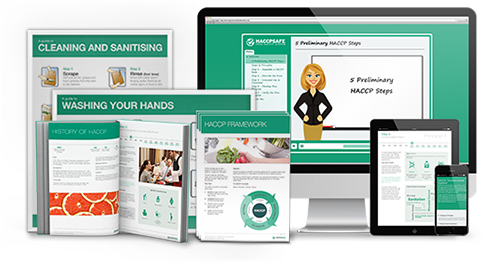 It’s easy to develop a HACCP food safety program with our step-by-step instructions, templates and other easy to use tools. For all questions or concerns, our friendly and knowledgeable HACCP SAFE team are here to help. What is HACCP SAFE Pro? HACCP SAFE Pro is a comprehensive program for HACCP compliance. It includes HACCP Plan templates, instructional videos, ‘how to’ guides, display posters and regular updates. It’s the quickest and easiest way to become HACCP compliant! A complete set of interactive templates enabling you to deliver a comprehensive end-to-end HACCP Plan for your food business. 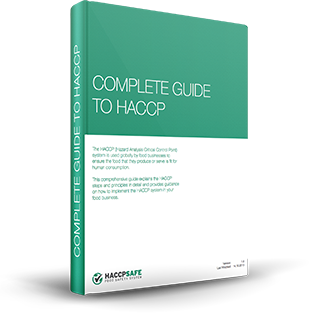 Detailed guides with step-by-step instructions, examples and useful information on how to implement HACCP in your organisation. A series of videos detailing everything that you need to know about HACCP and delivering a HACCP food safety system. Downloadable workplace display posters covering important HACCP food safety rules for your staff to follow. Your HACCP SAFE Pro Kit Licence entitles you to 12 months' worth of updates – reflecting legislation changes, new templates and more. Help when you need it. Our friendly support team are here to answer any queries or concerns about the HACCP SAFE program. "HACCP SAFE makes it incredibly easy to develop a HACCP Plan and food safety system. Highly recommended." We used HACCP SAFE Pro to get ready to export. It was quick, easy and the support was great. Preparing a HACCP Plan for the first time was daunting but the HACCP SAFE Pro Kit was a real help. The Institute of Food Safety (IFS) is dedicated to helping food businesses and food workers to meet their legal obligations by helping them to develop solid food safety skills and knowledge. Our goal is to ensure that our clients keep their business, their customers and their staff safe. We do this by delivering premium food safety education and training, and providing exceptional help and support to our clients and students when they need it most. The Institute of Food Safety (IFS) is an organisation with a mission to improve food safety standards by using education and training programmes in partnership with government and industry. HACCP SAFE, the HACCP SAFE logo and haccpsafe.com are trademarks of The Institute of Food Safety. Copyright 2014 © Institute of Food Safety. All Rights Reserved.